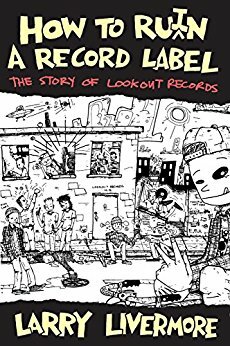 Green Day, Rancid, Operation Ivy, Screeching Weasel, The Queers, The Mr. T Experience, the list goes on for all of the influential punk and DIY artists that Larry Livermore signed to his label, Lookout Records. The label was a breading ground for new and emerging talent in the late 80s and early 90s in the Bay Area of California. By the time of the Millennium, the label went belly up and it was nothing more than a memory to fans and those who they influenced along the way. Last year, Livermore put his memoirs together and told the definitive story of Lookout with his book, How to Ru(i)n a Record Label. In a label that started out in a small house in Northern California turned into a multi-million dollar company before he walked away from it all. Livermore chronicles and details what happened and for the first time, a first hand account as to what led to the fall of the legendary label has been told.